How are companies using EMNS to maintain business continuity? What do organizations look for in a good notification system? What features are users hoping to see in future EMNS? 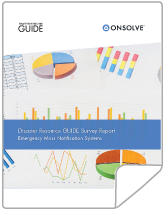 Fill out the form to download the survey and expand your understanding of emergency mass notification in the modern business world. © 2017 OnSolve, LLC. All rights reserved.